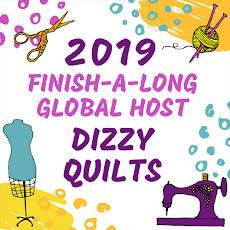 I have another finish from the 2018 Quilter's Planner Magazine to share with you: Linked Within. Linked Within was designed by Paige Alexander of Quilted Blooms. I loved Paige's version so much I went with the same colours but used Kona Ice Peach as the background instead of white. The orange is Kona Torch and the turquoise is a Cloud 9 print I've had in my stash for a while. The backing is a super soft flannel - it doesn't match the colours on the front at all, but I don't really mind. For some reason, I really wanted flannel for this quilt back and this is all I had that sort of works. I once again went with wavy lines for the quilting. These lines are quick, easy and I just love the look of them. 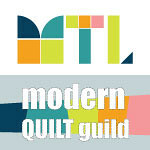 I will be linking at Katie Mae Quilts for TGIFF and at Crazy Mom Quilts. Paige's design is lovely and your version is fantastic. The soft peach background makes it have a sunset glow! Very nice design and your version is lovely! Izzy, the peach background is lovely with orange and aqua! Fabulous finish! Love these colors, and so neat that you used the color scheme of Paige's original version. Lovely finish! Yvonne is right! It does "glow"! I like it up close and from a distance! Great Job!! Beautiful take on the design, I love the background color paired with the orange and blue. I need some more of that Iced Peach in my life - it makes for a beautiful background! Well done! Lovely quilt. Cozy backing fabric. PERFECT!! What a beautiful quilt. With the flannel backing and simple quilting it looks perfect for a snuggle.